I always love these types of in your face marketing stunts. 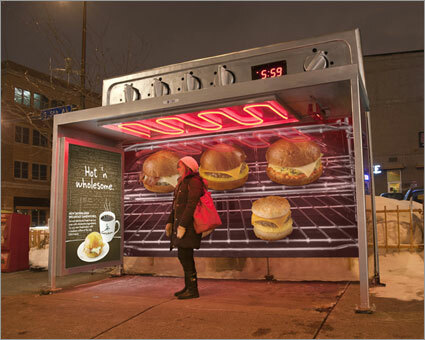 Here you have Caribou Coffee outfitting bus shelters with heat lamps to mimic Caribou's new breakfast sandwiches. What better way to get your customers to remember who you are by literally tossing them in your oven! I don't know about you but I hate waiting for public transportation especially in the cold. SO...with that said, if you make the wait somewhat more enjoyable, you've got my vote and I'll pay a visit to your store! What do you think of it? On another note, you may or may not know this but I work as a social media volunteer at Autism Speaks. I've been trying to think of news ways to engage the audience on the 5K Page I work on. So...I recently took on the idea of video blogging and my first attempt can be seen below! How do you think I did? Any other cool ideas for future videos? Let me know! Otherwise remember to LIKE the Autism Speaks 5K page on Facebook!